Conveniently located on 1st Street in Medicine Hat, our team at River Dental has been serving the community together since 1979. What makes River Dental different? Our team is composed of seven dentists! With an experienced professional always on hand to help, we pride ourselves on convenient and thorough care for each and every one of our patients. Our practice is open early, and we work as a team to deliver dental care to you and your family. 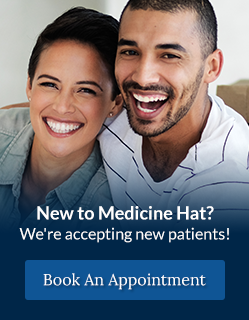 We proudly serve the communities of Medicine Hat, Redcliff, Dunmore, Irvine, Elkwater, Oyen, Bow Island, Taber, Lethbridge, Suffield, Brooks, Bassano, Burnstall, Richmound, Fox Valley and Maple Creek. No matter where you are, we're here for you! The original dental clinic located at 569 2nd St SE was opened some time in 1945 or 1946. The unique group practice was created by dentists A.E. Slack, Ted Slack, Lyle Wyatt and Elmo Fletcher. In 1950, Al Soklofske replaced Dr. Fletcher, who moved to Lethbridge. In 1956, Jack Snedden replaced Dr. Soklofske who had started his own practice in the Town Theatre building. 1n 1957, Dr. A.E. Slack passed away, and was replaced by Dr. Bob Gray in 1958. Dr. Wyatt retired in 1961 and was replaced by Dr. Al Garden. Drs. Snedden, Gray and Garden moved their practice to our current building on 1st Street in February 1979, and we continue to serve the community and pay homage to our original founders. Our team provides dental services in a warm, courteous environment. We take pride in being your choice for dental care. River Dental is a place where people care about people. Our team never stops learning. With a strong belief in education, our team is absolutely committed to learning, staying up to date with changes in the industry, and being open to ideas. We treat all patients like family. We strive to provide dentistry to people from all walks of life and we have a strong commitment to serving our community. At River Dental, we have seven general practitioners. With such a large team, we are able to diversify and concentrate our energy in becoming well-versed in different areas, and offer our patients a broad spectrum of dental services. This includes orthodontics, endodontics, oral surgery, cosmetic services and sedation services. We encourage parents to start their children on a track to good oral hygiene early in life. Get your children exited to brush and floss daily by making dental care fun!